This invention consists in a machine specially designed to perform torsion tests on adhesive joints. This machine applies torsion loading to laboratory scale specimens for the determination of the shear stress-shear strain curve of these materials. The machine measures the torsion angle and torque applied, from which the shear stress-strain curve can be deduced. A major feature of the machine is the alignment procedure of the specimen, which is done vertically with a counter weight that guarantees perfect alignment. 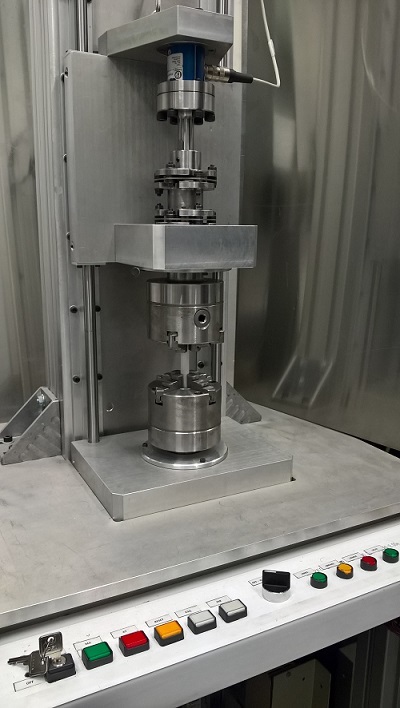 University of Porto’s inventors team built, tested and is operating a functional torsion machine which is already helping U.Porto Adhesives lab in its scientific and services activities. Adhesive bonding of structures is applied in aeronautical, aerospace, maritime, automotive, railway and construction building industries, among others. Adhesive joints optimize the strength and weight of the overall structure. The interest and knowledge about adhesive joint solutions are growing. The study and forecast of the adhesive joint behavior as a function of the service loads are major contributions for the design and application of adhesive bonding solutions. It is generally accepted that the stress-strain adhesive properties are better determined under torsion because there are not stress concentrations involved. There are machines in the market which are able to perform torsion tests on structural adhesives to a certain extent, but they suffer deformations that introduce spurious stresses in the specimen, reducing the accuracy of experimental results. The proposed solution can avoid such effects. The fact the specimen is aligned vertically avoids unnecessary loads and spurious bending moments on the adhesive joint sample during the performance of the torsion test. This is one of the most common drawbacks of horizontal machines. Moreover, the mechanics of the machine enables its adjustment during the test, compensating any undesirable displacement, thus removing any no torsion load on the specimen. The present torsion machine is able to give a complete, online, characterization of the material and its performance during the torsion loading. Torsion machines are uncommon in laboratories because tensile loading is the preferred method of loading. However, in adhesive and polymeric materials, tensile loading is not sufficient for the complete characterization of the material and torsion is a plus. This machine is targeted to testing machine makers because it reinforces the utility of torsion machines in the market of testing machines. The main buyers of testing machines and services are aeronautical, aerospace, maritime, automotive, railway and construction building industries, among others.